At lunch time this place is hopping with busy customers on their lunch breaks. The walls have large colorful murals which reflect the home towns of the three partners who own Arizona’s ten Fired Pie locations. It’s a cafeteria style set up where you choose a pizza or salad from the menu or you can create your own combination. The pizzas have a nice thin crust with a little crispness at the edges. 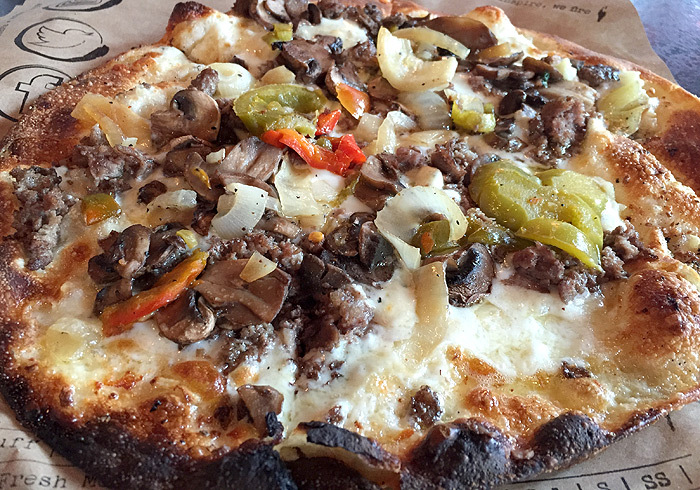 We tried the steak and blue pizza from the menu, which was delicious. The steak and blue uses garlic and oil instead of marinara sauce, and thinly sliced steak, mushrooms, peppers, onion and Gorgonzola. We found it to be very flavorful specially when the Gorgonzola hit our taste buds. We also tried a build your own pizza with garlic oil, spinach, tomato and fresh mozzarella. I think we might have preferred a bit more spinach, but the flavors blended well. We sampled the steak and blue salad and the field greens & roasted veggie salad with veggies, mushrooms, onions, artichokes, feta and balsamic vinaigrette. I loved the cold sweet peppers, and once again the steak and blue was the stand-out. 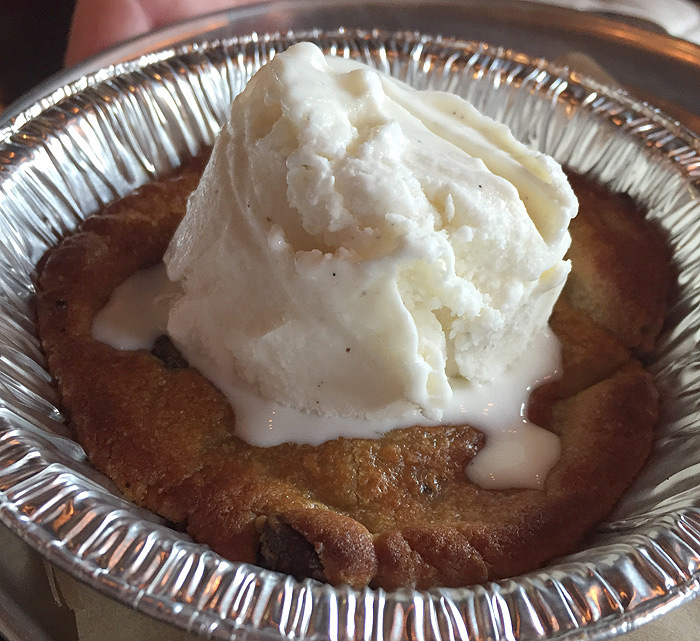 The dessert “Pookie” was a warm, soft doughy cookie in a tiny pie pan with a scoop of vanilla bean ice cream. According to Co-Founder Rico Cuomo all of the Fired Pie locations make the pizza dough, sauce and even grill their own veggies daily. 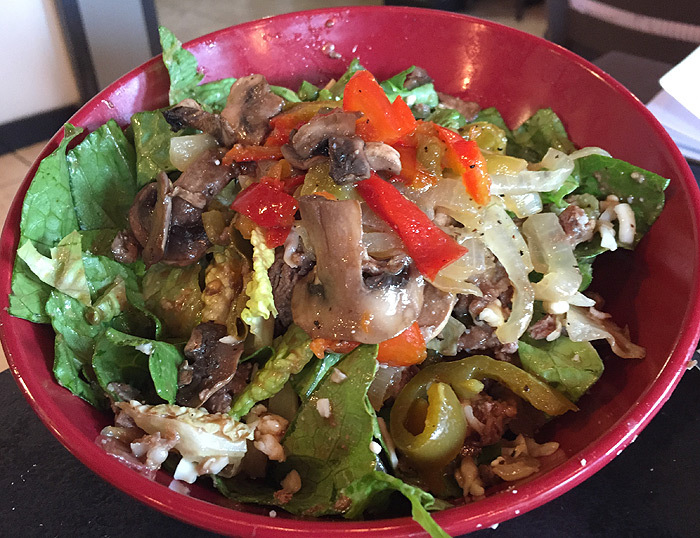 Prices are very reasonable at $7.95 for salad or pizza (the toppings are included, as many as you want!) Over all, a good value and great lunch spot. I need that steak and blue pizza in my life!!! OMG - that is totally my kind of pizza...and that Pookie looks amazing too! The steak and blue would be my choice. And that price seems great! I wish it were near me! The crust on that pizza! Wow. Looks amazing! 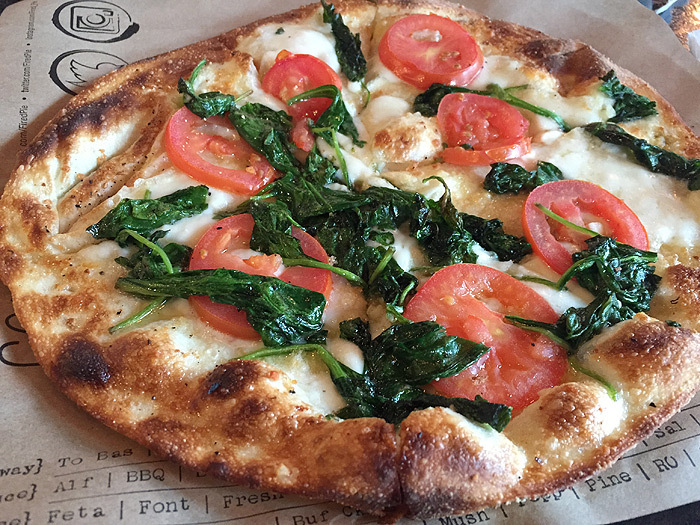 The garlic oil, spinach, tomato and fresh mozzarella pizza would have been my favorite! I need a fired pie in my life, like pronto! The crust looks like sheer perfection. Oh I love those thin crust crispy pizzas! These toppings sound great! Oh man! this pie looks great!